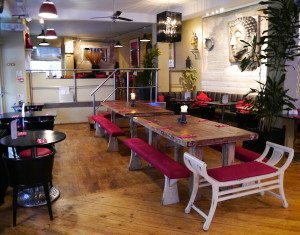 Finding a good roast in Brighton – it’s a Breeze! 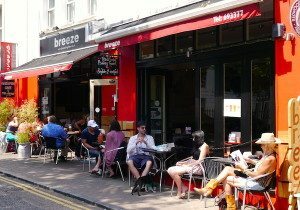 The Breeze Brasserie is located right in the middle of Brighton’s North Laine area, at one end of Trafalgar Street. It has an inviting exterior, with a scattering of tables under the awning to offer al fresco dining on those summer days. here is a very well stocked bar as you walk in, which we later realise, is necessary due to the array of wonderful cocktails available. Breeze has a sense of the European about it, sending me on holiday across the channel. The décor in Breeze, with Buddha heads and splashes of gold on the dominant red interior, take me further afield still. Quickly we are greeted by our waiter and then the owner, both of whom are very friendly, and shown to our table. Breeze has an extensive menu, offering brasserie style, European inspired cuisine for all palates. The a la carte is thoughtful and plentiful, with main dishes spanning pasta, burgers – not just of the beef variety, steak, fish and even confit duck leg. The starters, or ‘light bites’, sound equally as impressive, with a good selection of meat, fish and veggie options. The ‘deep fried camembert’ and the ‘Mussels’ in a classic white wine sauce in particular catch my eye. Breeze also boasts an appetising breakfast menu, which leaves no stone unturned with 11 different breakfasts to choose from. I am thrilled to see that my all-time favourite breakfast is featured, ‘Eggs Royale’: smoked salmon and a poached egg served on a toasted brioche (which I think is a nice touch). I certainly know where I’ll be coming for breakfast next time I’m in town…but for now, me and my friend in tow, are here to sample what Breeze has to offer us in the way of the good old Sunday roast! As always, I can’t stop myself from doing a little scan of the room, to have a nosy at the other diners’ choices. What I consider great about coming to a place like this for your Sunday roast, is that you don’t have to have a roast if you don’t fancy it. I can see that this was precisely the thinking of several of our fellow diners today. Many of them tucking into a traditional roast lunch, others ordering pasta, or fish, or anything else that grabs their fancy from the a la carte. You see, unlike the more traditional pub setting where only roasts are served on a Sunday, at Breeze you really can please everyone. Whilst perusing the brasserie, my friend and I also notice the healthy portion size of the roasts adorning the tables. With this in mind, we make a decision to ensure that we can enjoy, and most importantly, finish our roasts. We both agree to order our main event, followed by a dessert and on this occasion, bypass the starter. 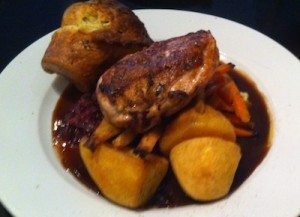 The dedicated roast menu itself consists of beef, chicken and a nut roast as the vegetarian option, all at around £10. This makes the decision easy for us. I was always going to have chicken and quite conveniently, my friend goes for the beef. According to the menu, the roast is served with ‘all the trimmings’, which adds an element of mystery to the meal, as none are listed. Having sampled many roasts over the years, with many different people, one thing everyone always agrees on, is the importance of the ‘trimmings’. You want the staples – the Yorkshire pud, the roast potatoes – but a sign of a really good roast is that extra special veg you might be lucky enough to get on the side. The added bonuses that you were not necessarily expecting when you ordered your roast, but you are more than happy to see when it arrives. Knowing a little bit about Breeze, I know they pride themselves on using fresh, local produce, so whatever these trimmings are, we know they will be in keeping with this ethos, which also pleases me greatly. I think it is worth mentioning at this point that although these three options were the only options on the menu under the ‘traditional roast’ heading, the other dishes that you might want or expect on a roast menu can easily be satisfied by the a la carte. To tempt all the pork lovers out there, ‘slow roasted pork belly’ with a chorizo mash, roasted carrots, cabbage and a spice scented cider jus, is a dish offered all week round, unlike the ‘traditional roasts’. Frankly, I am not surprised as it sounds wonderful. Just as enticing, is the ‘lamb miele’, which is a rump of lamb served in honey and mint sauce, topped with toasted pine nuts and served with mash and potatoes, also from the a la carte. Along with our roasts, we order two coffees to enjoy before the meal and a jug of water for the table. In keeping with the rest of the menu, almost every drink you could imagine is available at Breeze, alcoholic or otherwise. The drinks menu is the same size as the a la carte and that is not including the cocktail menu. We ponder over our trimmings some more, drink our coffees and after a reassuring waiting time, lunch is served. Straight away we know it is good. The gravy that covers our plates, is not only ample, but thick and aromatic. We can smell how good it is before we taste it. 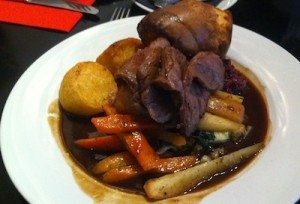 Any apprehensions we might have had that only pubs, or our mums, can make good roasts, evaporate immediately as we tuck into the treats on our plate. Our ‘trimmings’ are colourful and interesting. The red cabbage is full of fruity, festive, flavour. are crispy on the outside and fluffy on the inside, always the mark of a good roast! My friend raves that the beef is tender and full of flavour..
My chicken, which is served on the bone, is also cooked very well indeed. It has perfect, browned skin and buttery meat. The whole plate is finished off with the big fat cherry on top, a crunchy, doughy, large Yorkshire pud. When that last magic mouthful is gone, as is often the case, we sit back and revel in our achievement. Two clean plates, two very full tums…but wait, didn’t we say we would find room for dessert? Dessert is an easy decision for me. Not known for my sweet tooth, there is usually just one thing that appeals to me. However, this is not the reason that the decision is easy today, in fact so many puds appeal to me…but just one stands out! ‘Lemon cream tart’, creamy, lemony custard, encased in shortcrust pastry, a favourite growing up, I still can’t resist this, however full I might be. My friend orders the pear and apple crumble, arguing that only one dessert can really follow a good roast and that’s a crumble. We place our dessert order and hope we are given a little breather before they arrive. When they do, the first thing we notice is how beautifully presented our desserts are. We both especially like the rustic wooden board that the individual bowl of crumble and cup of cream are displayed on. 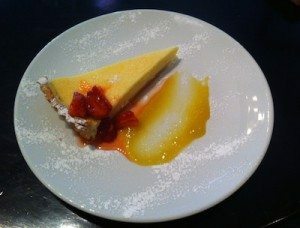 My tart is decorated with a vivid red, strawberry compote and a thick, sweet mango coulis, both complimenting the fresh zing of the lemon and more savoury crust of the pastry. The crumble is comfort food in a bowl..
..with the warm aroma of cinnamon coming from the roasted apples and pears and the biscuit topping, made from almonds and oats. We polish off dessert without too much trouble at all and then peacefully fall into our food comas. What a lovely way to spend the afternoon. We are in no rush and the pace at Breeze has suited us just fine. We have been cared for, but not bothered and the food has ticked all the boxes of a lazy Sunday lunch with friends. To sum up the roast at Breeze, I would say it feels a bit special. There is a certain quality to the ingredients, which makes the otherwise simple components to this much loved dish, super tasty. For me it is the variety of flavours we have been treated to today that makes the roast at Breeze a great roast. I have felt at ease here. Genuinely good food, with attentive service, played out to a breezy back drop – all in all, the perfect combination!